The first thing that we need to do is to tell Dreamweaver that it’s okay to open a .scss or .less file – something that Dreamweaver by default doesn’t understand. You’ll first need to take a peak in your personal Dreamweaver configuration folder – on a Mac, that’s located in ~username/Library/Application Support/Adobe/Dreamweaver CS5.5/en_us/Configuration – and locate a file named “Extensions.txt”. If, for some reason, this file doesn’t exist, you can edit the master file located in Adobe Dreamweaver CS5.5/Configuration. Open the file and add SCSS (or SASS if you’re using the older syntax) and LESS to line 8, so that it reads: CSS,SCSS,LESS:Style Sheets. Save the file and restart Dreamweaver. You should now be able to click on a .scss or .less file in your Site panel and have it open in Dreamweaver. 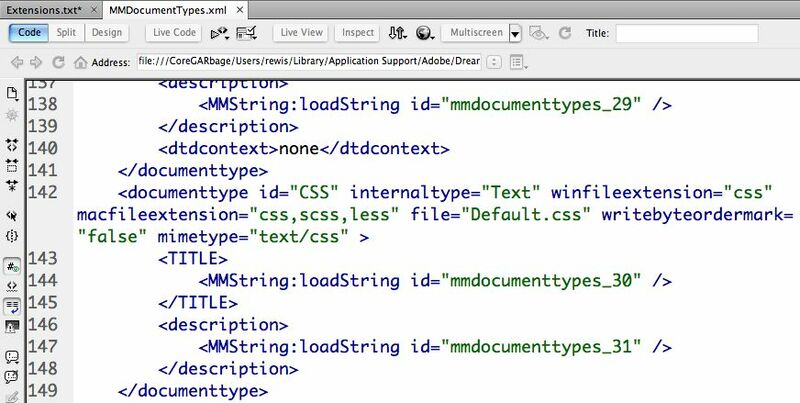 Now, in order for Dreamweaver to understand that this, in fact, is a CSS file, you’ll need to edit MMDocumentTypes.xml located in the DocumentTypes folder in the Configuration folder. Open this file and scroll down to line 142. 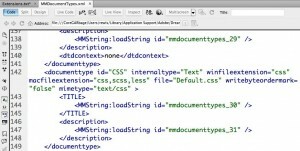 You’ll notice two properties on that line: winfileextension=”css” macfileextension=”css”. Add scss and less (comma seperated) to the appropriate property for your platform. Save the file and restart Dreamweaver. Open your .scss or .less file and you should see your familiar CSS code coloring and hinting! If you’re serious about your Sass and/or Less, you should be using CodeKit, IMHO. CodeKit, in addition to other things, monitors your scss (or less) file for changes and then compiles it into CSS. I’m using CodeKit and Sass on every project – and loving it! To optimize my workflow, I actually link to the .scss file in my HTML (just remember to remove it before pushing the page live). 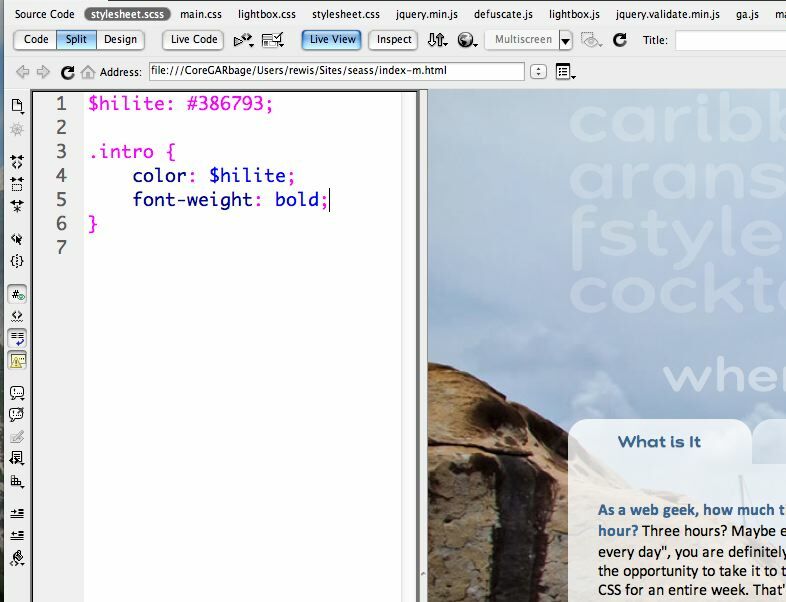 That way, I can use Dreamweaver’s split view to edit the .scss file while looking at the page with Live View turned on. When I save the .scss file, CodeKit compiles the file into a CSS file that is also linked in my page. Sadly, Dreamweaver doesn’t know when the CSS file is changed, but simply hitting F5 (or the refresh button at the top of the document window) causes Dreamweaver’s Live View to refresh and I can see my changes. Could you write same tutorial for window user? Curious about CodeKit. If you don’t mind sharing your thoughts on it and what it has done for you in regards to productivity and efficiency, hit me up via email. Thanks for this. Before I jump, is this in Lion? 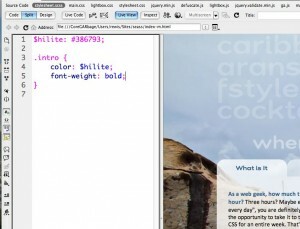 I’d like to know more about Codekit too, like how to make it link with Dreamweaver as you mentioned above. Obviously I know little. I have Dreamweaver CS4. Does this work for CS4 on a PC? Just what I wanted to know. Though I configured on Windows, the instructions were easily translated. Great tips, Greg. Thank you! Perfect, resolved my DW CS6/SCSS search woes! Is there something different when it comes to Mac Mountain Lion, Dreamweaver CS6, and file locations. I can not get this to work. I only have the directories listed under the applications folder, and nothing here ~username/Library/Application Support/Adobe/Dreamweaver CS5.5/en_us/Configuration or any other folder that represents Dreamweaver, as this one specifically says CS5.5. I did modify the files that you mentioned to a “T”, even tried copy a pasting your file. Then I also set the file properties of the .scss file to open in Dreamweaver, but there is absolutely no color syntaxing. It does however open and in code view but no color to help out. @Paul Krey: Thank u ! That was my fault :) I changed the files in programes/adobe/dreamweaver and it didnt worked. This worked well on my Mac, but my Win7/64 machine does not have a DocumentTypes folder in its Configuration folder, and no XML file with that name either. For some reason, my DocumentTypes folder is in a configuration folder within Dreamweaver’s own folder (not my user folder). Worked like a charm! But my Extensions.txt file was located in the Applications/Adobe Dreamweaver CS6/Configuration folder. This must be new with CS6. I don’t refer in my html to the .scss files. In Dreamweaver Preferences (general) I uncheck ‘Enable related files’, restart DW. And then open the html file and the .scss files. So every time I edit the .scss files, CodeKit compiles the file and I can continue working in DW (without DW asking me to update the css file in the related files. Worked for me on Win7/64. Much appreciated. Thanks Adam, it really helped me a lot since I’m still new in Less and Sass. Thanks for your tutorial! I made the changes, but DW CS6 doesn’t color the scss code. Any idea, why? I like that my SCSS workflow can work in DW now. One thing that doesn’t seem to work is nested selectors don’t appear in the proper color. Hopefully Adobe will come up with a fix to make it work natively. “I know on my end I stumbled across the solution and I do hope this works for you as well. If you are working in Mountain Lion with cs6 I can tell you I couldn’t find one of the sets of files because they were in a HIDDEN /library folder in my user directory. Then hold “Alt/Option” and right click “Finder” then click “Relaunch” in the pop up menu. From there you will be able to find the /Users/”USERNAME”/Library/Application Support/Adobe/Dreamweaver CS6/en_US/Configuration/extensions.txt and /Users/”USERNAME”/Library/Application Support/Adobe/Dreamweaver CS6/en_US/Configuration/DocumentTypes/MMDocumentTypes.xml. I have set up CodeKit on my Mac today, but as soon its running Dreamweaver cant safe the less files any more. I get an access denied error. When quitting CodeKit DW is saving files without any problem. Seems that CodeKit blocks the files or OS X thinks it does. I’ve got Dreamweaver CS6 on Windows 7. I did all changes to config files and even have restarted my machine. Still don’t see coloring. It was working for my CS5.5 version before. Thanks for the helpful post. Can anyone point me at the config file that determines which file types Dreamweaver includes when searching though files? Thanks in advance. I hope this will work for all. Try it once. Hi, Thank you very much for this…I’m still new to .LESS and .SCSS, and being the Dreamweaver lover that I am this tip is priceless. Additional thanks to Biotess who’s Mountain Lion solution worked perfectly for me. Thank you thank you thank you! I just got Codekit to compile LESS files, but I still want to use the autocomplete and css hinting of Dreamweaver . This gives me the best of both worlds.